Calling all you romantics out there who have set their wedding date on Valentines day. Many people associate February 14th with the color red. Your invitations can also be choose in various colors such as golds, bronze colours. Try adding a little lace for a romantic touch. For our own invitations back in the day. We ordered a rectangular envelope style. The top part of the invite overlapped. Meeting in the centre of the front. Then we choose a pair of love hearts which sealed the invitation. 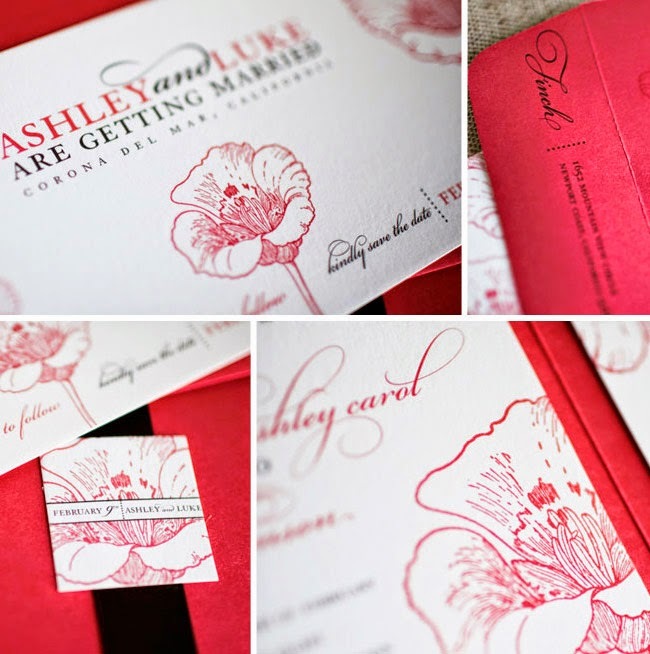 We also choose to have a scalloped design around the edge of the invite. We choose lemon and white colours. You can perhaps pink and silver. Or try red and white for a passionate invite color. Another idea for your romantic cards would be a single white rectangular card with silver writing. The couples can have the bride and groom names written on the front. Try choosing a red color or pink colour. Add a ribbon complete with a love heart circle filled with zirconiums. 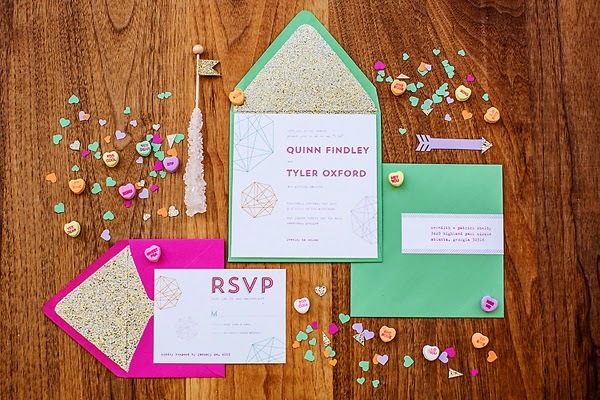 Attach the ribbon to either the side of the invite or in the middle of the invitation. Perhaps just underneath the names. Try gluing a couple of zirconiums onto the invite to add a little more glamour. Butterflies are also associated with romantics. You can make your own hand made wedding invitation. Try pasting small butterflies onto your cards. Again you can either select a red colored invite or a pale pink invite. For the truly romantics. You can choose to have a pale pink border around a white invitation. Add a little white lace over the top of the border. Attaching a pink ribbon on one side of the border. Select some artificial pearls and place them over the lace. You can try and intertwine the pearls around the ribbon to complete the look. For the ultimate in romantic gesture why not use lace to cover your invite instead of envelopes. You can secured with a brooch pin. 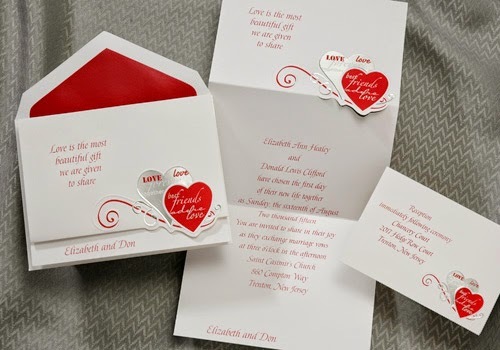 Then hand deliver your invites to your guests. The lace can be in a pretty cream color. Try using a soft pale pink colour for a floaty, romantic invite. 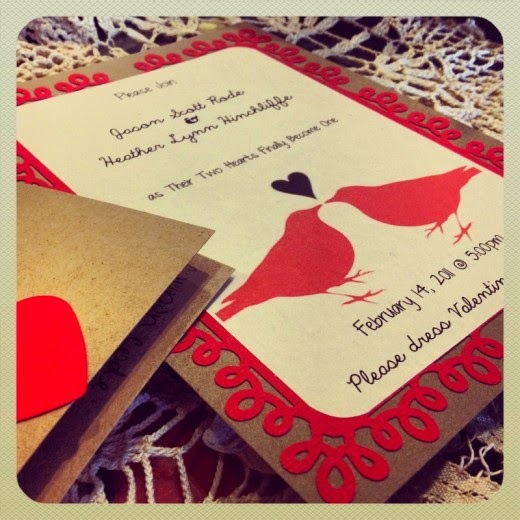 A Valentines Day wedding invite is always with a vibrant red color.